As I sit here writing, there's a big storm blowing through Kansas City. The sky looks a little bit green. I admit: I love a good storm, but now that I have kids, I have to be a little more cautious and prepared when they are headed our way. I don't typically have my weather radio turned on, as its noise would wake my kids if a storm should strike during the night. But both my husband and I receive alerts by email from our city when there are weather threats on the way. However you choose to prepare - just make sure it is a method you can trust! We all know that disaster can strike at any time. No matter where you go in the country, every region has it's own nasty weather conditions. In light of that, it's important to be prepared for these eventualities. This week, Mostly Together Mommy has been talking about emergency preparedness. She has discussed everything from preparing for a natural disaster to creating an emergency plan. Hop over to check out some of her tips - plus get to know some fantastic companies that have some fabulous products. 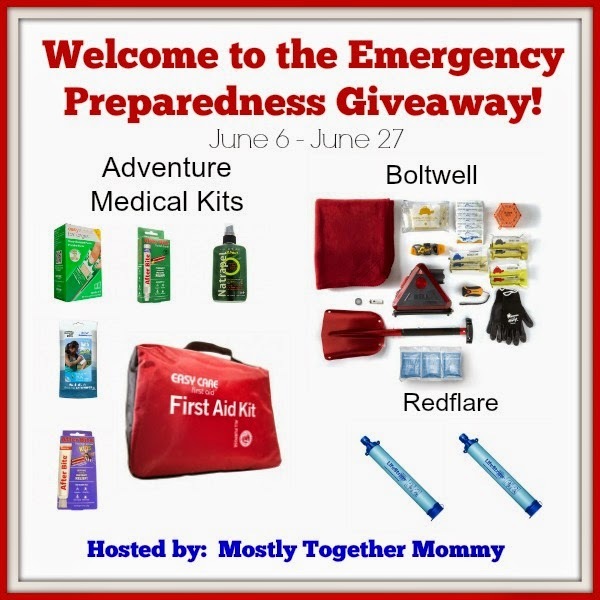 These companies are so committed to preparedness that they have come together to help you all be prepared by giving away some fabulous prizes! One reader will win a $300+ Emergency Preparedness Package. This giveaway will end on June 27. This giveaway is open to Continental US. One entrant per household. *The participating bloggers have not been compensated for promoting this giveaway. Sponsors are responsible for prize fulfillment. This giveaway is not affiliated with Facebook, Twitter, or Pinterest. This would be the perfect addition to our hurricane supply kit. Most excited for the medical kit. The medical kits, my kids are clumsy. I'm most excited about the lifestraw water filter but everything is awesome. The car kit will really come in handy during our summer travels. The water filter! Thank you for the chance!! I have wanted to do something like this for preparedness, just haven't got around to it, so winning this would be truly awesome. I love the medical kits. Most excited about the car kit! i am excited about the first aid kit. I'd love it all - LOL - but I'd love to try the LifeStraw Water Filter - they look awesome!